InSight Peer Reviewers serve at least one year on the InSight Peer Review Board and review at least one blind manuscript while on the Board and provide constructive feedback to the author(s). The review(s) are submitted to InSight on or before the 4 week deadline. InSight: A Journal of Scholarly Teaching is an academic publication designed to highlight the work of postsecondary faculty. The journal is published annually by the Park University Faculty Center for Innovation. 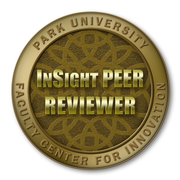 The InSight Peer Review Board are relevant topic experts internal and external to Park University and serve across the disciplines.